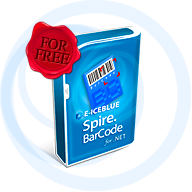 Free Spire.Barcode for .NET is a FREE and professional barcode component specially designed for .NET developers (C#, VB.NET, ASP.NET) to generate, read 1D & 2D barcodes. Developers and programmers can use Spire.BarCode to add Enterprise-Level barcode formats to their .net applications (ASP.NET, WinForms and Web Service) quickly and easily. Free Spire.Barcode for .NET provides a very easy way to integrate barcode processing. With just one line of code to create, read 1D & 2D barcode, Spire.BarCode supports variable common image formats, such as Bitmap, JPG, PNG, EMF, TIFF, GIF and WMF. Note: Free Spire.Barcode is a community edition of Spire.Barcode which supports to work with many more barcode types. If free Spire.Barcode does not fulfill your needs, please upgrade to the paid version of Spire.Barcode.